Transcendental knowledge, 'divya-jnana', comes down from Lord Sri Krishna, the Reservoir of all knowledge. It is thus eternally true and potent: 'apauruseya' superhuman, self evident, and 'adoksaja' reality beyond the limited material mind and senses. When divya jnana is received from the pure teachers descending from Sri Krishna, it is actually God Himself manifested as transcendental sound 'sabda brahman' full of divine potency 'krishna shakti' to awaken all souls to their eternal (pre-existing) service relation to Him. Such are the inconceivable glories of divya-jnana that it can factually deliver all souls into the eternal association of God through His intimate servants. Essential to this deliverance is the quality of the transmission of this divine force. Lord Krishna arranges an infallible means for transmitting the full potency of His mercy and knowledge through the system of 'guru parampara'. The Lord states in His Gita (ch.4 v.2): "evam parampara praptam... This supreme science was thus received through the chain of disciplic succession...". By the Lord's empowerment of His surrendered servants, He enacts through them the deliverance of all sincere aspiring devotees. When a disciple becomes totally obedient to his own teacher's authorized instructions (i.e. received through the guru-parampara), by this ‘vaniseva', serving his instructions as his very life and soul, he also becomes empowered to effectively teach others the same pure service. Thus the essential qualification of such a servant-guru is his unconditional 'guru-nistha', perfect faith in his own guru, and utter fidelity to, and knowledge of the pure 'vani' (authorized knowledge) and its correct 'siddhanta' (authentic conclusion) coming down through the guru-parampara. To preserve the undiluted transmission of this vani-connection, a true guru never changes the truth, but teaches only this authorized knowledge authenticated by 'guru-sadhu shastra'. The disciplic succession's integrity is preserved intact by such a system of check and balance: a genuine teacher only imparts God's revelations 'sastra', also explained and exemplified by His saintly devotees 'sadhus'. Thus there is always a perfect cohesion and harmony between guru, sadhu and shastra. Such a genuine teacher's life should fully demonstrate the essence of all divya-jnana: selfless service to God. By surrendering to such a true guru, the disciple also comes into communion with all the predecessor gurus. All service and worship offered to his own guru is simultaneously distributed throughout the entire parampara. Thus the faithful disciple attracts the full blessings of the entire parampara, manifested within the person of his own guru, in whom all other gurus are also present, up to Adi-guru Sri Krishna Himself, by His inconceivable potencies. Such is the miracle of the parampara and guru-tattva: a surrendered disciple thus receives the abundant mercy and potency of the entire parampara by faithfully serving his own guru. Proportionate to his surrender and devotion, he becomes thus empowered to also transmit this transcendental connection into the hearts of his own disciples. "A spiritual master is recognized as an actual guru when it is seen he has changed the character of his disciples." (Ch. Char. Antya 3.143 purport) As Srila Prabhupada often quoted from the Vedic aphorism "phalena pariciyate": a tree is judged by its fruits, one is recognized by the results of his actions. The sentimental infatuation of zealous followers of bogus teachers is a sterile surrogate for the true spiritual reciprocation coming through the authentic Vaisnava lineage. Within the greater Acyuta Gotra, Srila Prabhupada has a very prominent and specific service. Specially chosen by Sri Chaitanya and His associates to bless all souls with the inexhaustible mercy of Mahaprabhu, he is thus empowered to fulfill Their munificent desire to distribute Krishna Consciousness on a global scale. As the founder-acarya of ISKCON, Srila Prabhupada is forever recognized as the fountainhead of our ISKCON sampradaya: the living via-medium to the entire Gaudiya parampara. Within his all-encompassing teachings, in the form of his books, lectures and discussions, is preserved in its most succinct and accessible presentation the complete 'Gaura-vani', the full legacy of Lord Chaitanya's empowered followers: the highest revelation of God's personhood and loving relations 'Krishna-tattva'. In his words are manifested the full potency and mercy of the entire Gaudiya parampara. This purest 'Bhagavata-dharma' is the apex of all divya-jnana and the ultimate goal of the Vedas. 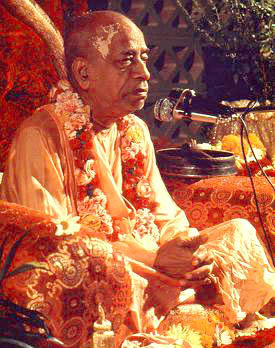 Thus Srila Prabhupada's teachings are 'purnam', covering the beginning, middle and end of the bhakti-marga. Hearing and propagating this divine message of Godhead is the service program for all generations of ISKCON devotees. We are blessed and purified by Srila Prabhupada's personal association the more we apply his vani in our lives. His mercy and association are available proportionate to our obedience to him. By sincerely cultivating the process of devotional service as revealed in his perfect teachings, we can all become blessed to realize our eternal service relation to the Gaudiya parampara, our eternal spiritual family. Therein lies the path to perfection and the miracle of parampara. All glories to Sri Guru and Sri Gauranga!